This year's Special Projects program includes a pop-up bookshop presented by Aperture Foundation, an installation by Ethiopian artist Ezra Wube presented by Pioneer Works' Visual Arts Residency 2019, "Artist Encounters" with Richard Mudariki, Lawrence Lemaoana and Wura-Natasha Ogunji, as well as the collector's choice program highlighting Ivorian photographer's Paul Kodjo's iconic work. 1-54 FORUM is the fair's unique discursive program that explores convergences across artistic and cultural production, critical thinking and ideas. Black Chalk and Co., an artist collective founded by Zimbabwean artists Nontsikelelo Mutiti and Tinashe Mushakavanhu, has curated a series of talks, screenings and performances entitled Why Don't You Carve Other Animals. You can find more information about the series here. Gallery 1957 at 1-54 New York 2018 © Katrina Sorrentino. 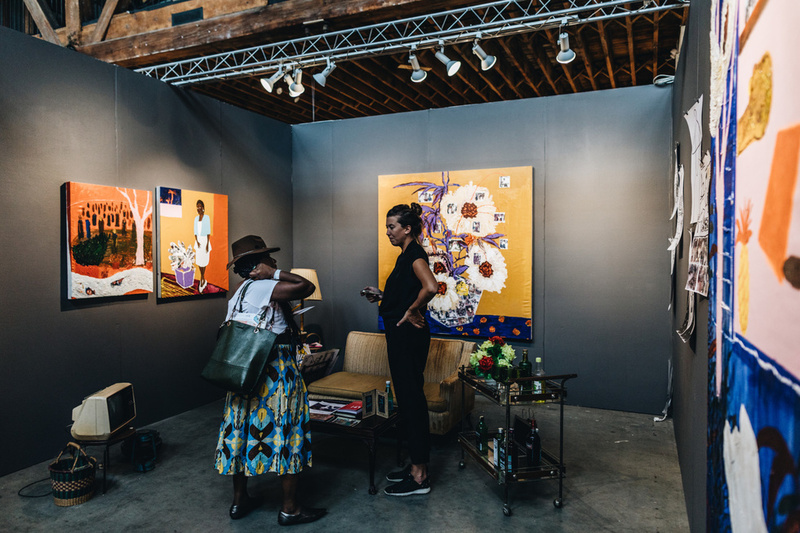 1:54 Contemporary African Fair runs from Friday, May 3 to Sunday, May 5 at Industria in Manhattan's West Village. Tickets are available to purchase online via Eventbrite. Keep up with 1:54 on Facebook, Twitter, Instagram and their official website.